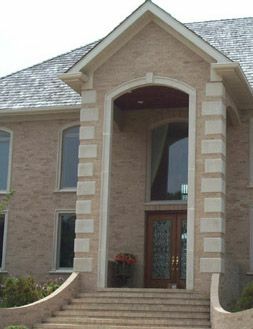 We carry bricks from a number of suppliers, offering you a wide variety of color and style choices to meet every need. Please use the search forms to the left to help select a brick color and style you like. If you can't find what you're looking for, please call us. The brick you choose when constructing your home is one of the most important decisions you'll make. The color and style of brick you choose will influence all the other selections you make. Even the way the brick is made will affect the appearance of your home. To make extruded bricks, the brick material is pushed through a die under very high pressure. This long strip of material can then be sliced create the individual bricks. Extruded bricks have sharp, angled edges and are often texturized in an number of ways to give a more interesting look. If you have ever seen bricks with holes in the middle, you've looked at extruded bricks. Some people prefer a less regular look than extruded bricks normally have, but can't afford the unique style of handmade brick. Rolled edge brick offers an economical choice. Rolled edge bricks are extruded and then wheels roll the edges of each brick, giving a softer, less defined look to the edges. If you like soft, irregular shapes and a sand texture, then molded brick is right for you. Molded bricks are made by filling a box mold with brick material and then vibrating it and then releasing it. The old-world charm and quality craftsmanship of handmade brick creates an authentic look prefect for early colonial structures. Each brick is formed separately in wooden molds, and is therefore unique. No two are alike. Papercut brick is extruded brick that is then covered by a sheet of kraft paper. Wire cutters are then used to cut right through the kraft paper and the brick material, creating individual bricks with an irregular edge shape. For that homey, "used brick" look, we suggest tumbled or simulated tumbled brick. There is a charming irregularity to walls made of these bricks. Tumbled bricks are actually extruded fired brick that is tumbled, or sometimes by a mechanized process that incorporates a diverse textured pattern onto extruded, pre-fired clay. Renovating or redecorating? The light weight of thin brick makes it a popular choice. Thin brick is a brick veneer that can be applied to existing walls. Commonly used in commercial buildings, glazed brick is extruded brick that has a glaze applied to it just before firing. During firing, the glaze actually becomes a part of the brick, making it very uniform in color and highly durable. Glazed brick is available in a number of color choices and even speckled surfaces. 2017 Godfrey & Black Brick and Stone, Inc. All rights reserved.